Pano Of Austin by Frozen in Time Fine Art Photography - 14.000" x 6.875"
Pano Of Austin framed print by Frozen in Time Fine Art Photography. Bring your print to life with hundreds of different frame and mat combinations. Our framed prints are assembled, packaged, and shipped by our expert framing staff and delivered "ready to hang" with pre-attached hanging wire, mounting hooks, and nails. There are no comments for Pano Of Austin. Click here to post the first comment. 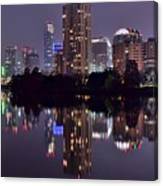 The Downtown Austin Texas city skyline and overall cityscape is best viewed from the river walk on the opposite site of Ladybird Lake. Lady Bird lake is basically a river that runs along side the metropolis. 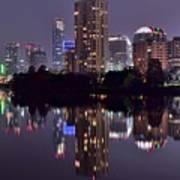 Austin is most notably the Lone star state capitol and very beautiful when viewed from the waterfront either day or night. There are many good vantage points for standard and panoramic photographic opportunities. While Dallas and Houston get most of the attention in Texas Austin definitely keeps up with them for joggers and cyclists alike. The river walking trail and path is very long and was highly traveled even on Christmas eve when I was there. There is an old-time riverboat available for tourists and towns people alike to take trips up and down the river. 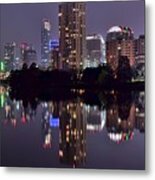 If this image interests you please check out my entire Austin gallery for a wide variety of day, night, color and black and white images as well as panorama views.